Do you know of an association, school, store, or studio in the NYC area that would like to host a marketing workshop by yours truly? Ideally, the event would draw at least 50 people. The evening of Dec 10 or 11 would probably be best. If you have an idea, send an email to Bob AT TheBuzzFactor.com and let me know. Or if you simply would like to attend such an event in the area, let me know and I'll put you on a special email list and let you know where I'll be. In New York I plan to talk about social networking and "The New Rules of Internet Music Marketing." I'm taking that same workshop this weekend (Nov. 11-12) to Nova Scotia, Canada, where I'll speak at White Point Beach Resort during Nova Scotia Music Week. Visit www.musicnovascotia.ca/default2.asp for details. And on Monday, Nov. 20, I will present the same workshop in my hometown of St. Louis, MO. It'll be held at the Regional Arts Commission, 6128 Delmar, 63112, 7 to 9 PM. 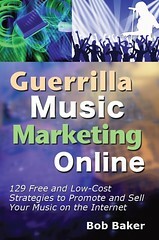 To register, just visit www.vlaa.org/workshops.asp and scroll down to "The New Rules of Internet Music Marketing." Or call 314-863-6930. In 2007, I plan to take my message on the road a bit more. So let me know about speaking opportunities in your city. Especially places like Chicago, Nashville, Memphis or Kansas City. You never know, maybe I'll come to your town and get to meet you in person. Ps-the winner gets a meeting with a record label~Sweet!